This postcard is for you. Wishing you were here next to me in the kitchen, talking about every thing and nothing at all. Laughing, giggling till the tears run from our eyes. Sometimes shedding real tears of anguish … or just moaning. Or else we could be in your kitchen. With the baby crawling on the yet-to-be-cleaned floor. Dinner gently simmering on the stove top. Perhaps a bit giddy from trying to finish last night’s leftover red wine. As I close my eyes, I see each one of you. A friend in time of need, of hope, of joy, of merely passing away the time in the company of someone with whom one is completely at ease. No invitation required here. Just ring the bell and walk in. Always welcome – day or night. I miss the kind of friendship that goes beyond scheduled dinners and lunches or coffee mornings. I miss the kind of friendship that transcends the Facebook variety. In my book, a friend is someone who is comfortable enough to call and say, I had a bad day, do you have time to talk or come over? I really need a hug. In my book, a friend is someone confident enough to share the great news of a new job or a new beau knowing that even happiness can be shared. Empathy is not only for the things that go wrong. It is also for the things that go right. In my book, a friend is someone with whom one can share simple pleasures like watching back-to-back episodes of Brothers and Sisters, eating popcorn and sipping ice cold coke. Feeling like a couple of school girls cutting class, leaving plates unwashed on the kitchen sink and the husband’s un-ironed shirts in the laundry basket. Perhaps as we grow older we have forgotten how easy friendship can really be. We have become encumbered by adult-inspired barriers such as political correctness, propriety and personal space. We find it harder to be spontaneous and to be truly honest. We are no longer able to just walk over to a friend’s house, because well… I have time today. Or pick up the phone and say ... hey, I miss you, want to have a cup of tea? 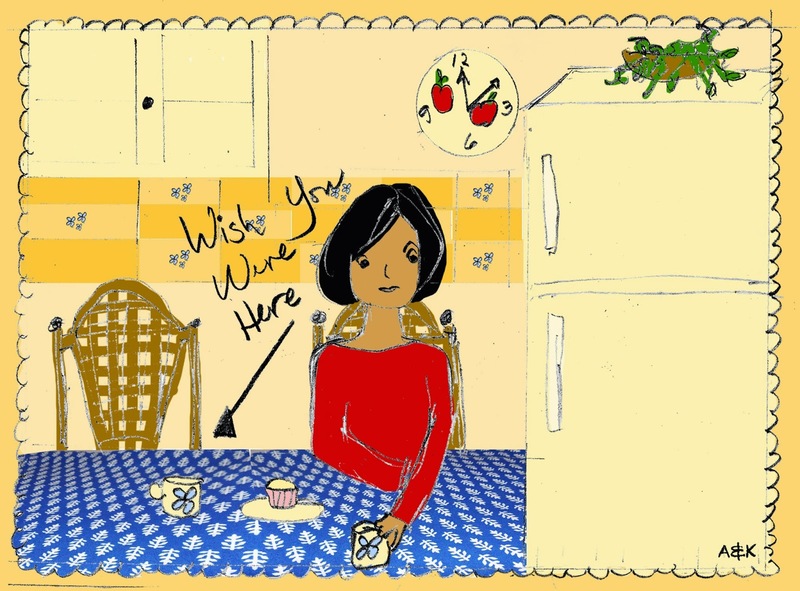 The postcard above is for all of you who have shared my kitchen table or in whose kitchen I have ever sat in (living room couches count as well! ); called on the phone or skyped; exchanged copious emails with; or even worst, suffered through my barely discernible handwriting. There is a chair in my kitchen waiting for you to fill. The one in my heart you already have. 1. Preheat the oven to 170C. Lay the paper cupcake molds on the tin cupcake trays or in the silicon containers. If you are not using cupcake paper, generously grease the cupcake tins. Silicon containers do not need to be greased. 2. Using an electric whisk, cream the butter and sugar together for 4-5 minutes until very pale. Beat in the eggs, one at a time, beating very well between each one, if necessary adding a spoonful of flour (or flour mixture) with the last egg to prevent the mixture from curdling. Beat in the orange zest. Add the flour all at once and mix in well, then slowly mix in the orange juice. 3. Spoon the mixture into the prepared tins and bake in the oven for 15-20 minutes or until a skewer, inserted into the center of the cake, comes out clean. Optional - For the icing, sift the icing sugar into a bowl and stir in the orange juice until you have a spreadable consistency. Spread it over the top of the cupcakes. The recipe above is for at least 12 normal cupcakes. But you can use the same recipe for mini-cupcakes. They will cook between 10-15 minutes. These cupcakes can be frozen, thawed and served when unexpected friends come to visit!! Alma, how many times have I sat at your kitchen while you cooked. Sometimes I did too! Sharing ingredients and recipes and that cup of tea! Love your recipes which I treasure, many of which I make often for guests and sometimes for the family too. Wish I could be in that chair! My dear Val, you are one of the reasons why i wrote this blog. I miss you and our friendship. What's the address? And - if I haven't already asked this - Is Valerie married? Colin, I answered your last post. Yes, she is married. And she lives in Florida. She is one beautiful person. Alma! This is beautiful. Thank you for writing and sharing. You have a fantastic voice! I've never really had the chance to sit over a cup of coffee in your kitchen...but do have wonderful memories of tasting your fantastic gingerbread with butter...Where's the recipe??? Thank you for starting this blog...it warms the heart and enriches the spirit. It is so Alma...Keep it up!